In the variable response, I can see the EntityCollection attribute, but inside, Related entities always come empty. I'd like to know if it is possible to retrieve the set of a given entities, with the related entities, using RetrieveMultipleRequest, rather than go one by one using RetrieveRequest. Use the AliasedValue as SergeyS recommends. Remember when querying 1:Many relationships, be aware that you could be returning multiple results for the same parent entity. This is what I use most of the time. Perform a second query for each relationship you want access to. You'll probably get better performance if you can use an IN statement in your second query, based on the results of the first, rather than performing a separate query for each result of the first. Below is some pseudo code to show the difference. Not the answer you're looking for? Browse other questions tagged dynamics-crm-2011 dynamics-crm or ask your own question. 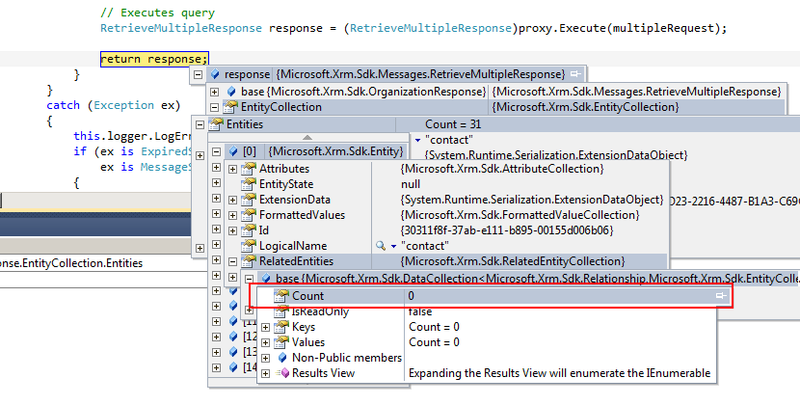 CRM 2011: Limitation of query expression? Microsoft Dynamics Crm Sdk - Is this query possible?